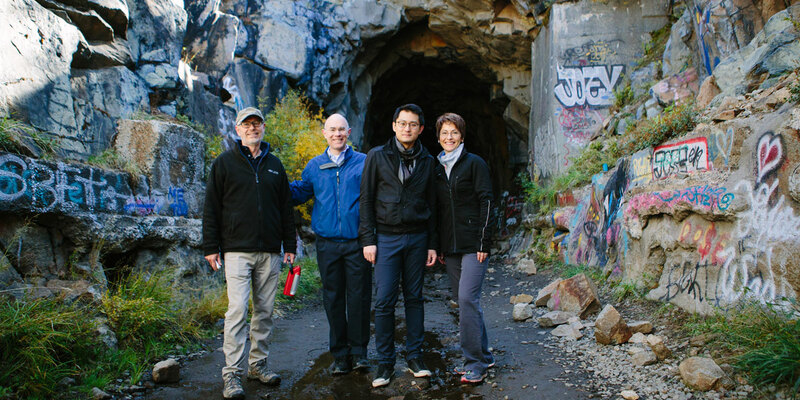 Tim Young, Scott Faulkner, Zhou Tian & Laura Jackson explore the train tunnels in Truckee, CA. 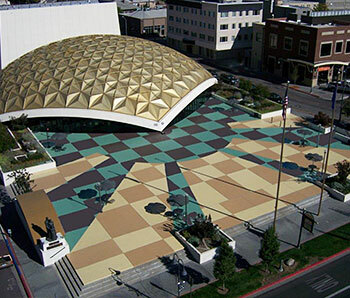 “Transcend” is a multi-movement orchestral piece, written in commemoration of the 150th anniversary of the completion of the First Transcontinental Railroad, and on the occasion of the Reno Philharmonic’s 50th anniversary. Begun in 1862 and completed in 1869, the Transcontinental Railroad effectively linked the US from east to west for the first time. Its cultural heritage includes the contribution of a thousands-strong Chinese and Irish workforce who toiled in severe weather and cruel working conditions. Numerous “hell on wheels” towns proliferated along the construction route and became famous for rapid growth and infamous for lawlessness. 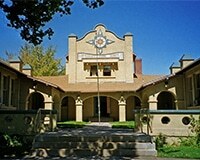 As the settlements pushed westward, there was a mixing of ethnic groups and cultures. (Unfortunately, as the daunting task of laying tracks over difficult terrain increased, many workers perished, and many of the rest were denied the American dream by the enactment of the Chinese Exclusion Act in 1882. But those who stayed brought Chinese traditional art and music into the fabric of American culture.) As a Chinese-born composer who immigrated to this country, educated at the nation’s top music schools, and now serving at one of its finest institutions, I was moved to create this new work to tell a musical story, to convey a sense of spiritual perseverance, and to pay tribute to my own cultural heritage. “Transcend” will likely have two or three movements and the orchestration will be standard triple wind. I chose the title “Transcend” as the First Transcontinental Railroad transcends differences of cultures and is a testament to the strength of humanity and its spiritual perseverance. I am still reading lots of history of the First Transcontinental Railroad, and I’m thankful for all who have sent books, pictures, and shared stories. I am excited that 12 other professional orchestras joined the commissioning consortium led by the Reno Phil and will perform “Transcend” in the future. I’ve been going through videos of those orchestras and their music directors to learn their performance style and sound. 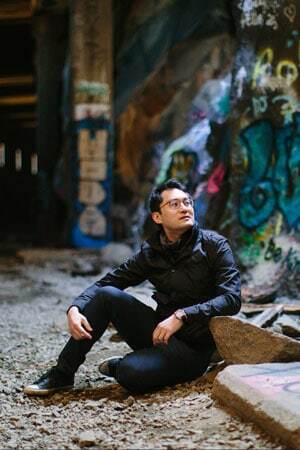 Nominee of the 2018 GRAMMY Award for Best Contemporary Classical Composition, Chinese-American composer Zhou Tian(JOH TEE-en; Zhou is his last name) writes music that is described as “absolutely beautiful” and “utterly satisfying” (Fanfare), and “a prime example of 21st-century global multiculturalism.” Born in 1981, Zhou came of age in a new China marked by economic reforms, and was in the United States by his 20th birthday. Trained at Philadelphia’s Curtis Institute of Music, New York’s Juilliard School and the University of Southern California, he studied with some of America’s finest composers, such as Jennifer Higdon and Christopher Rouse. His music has been performed by leading orchestras and performers in the United States and abroad, such as the Pittsburgh Symphony, Hong Kong Philharmonic, pianist Yuja Wang, and the Empire Brass. His recent works include the Grammy-nominated Concerto for Orchestra, premiered by the Cincinnati Symphony and Louis Langrée; The Grand Canal, performed during a nationally televised concert of the 60th anniversary of the founding of the People’s Republic of China; Petals of Fire, premiered at 2017 CBDNA National Convention; and Cello Concerto, premiered by Deutsche Grammophon Artist Jian Wang. He taught at Colgate University since 2011 and is currently on faculty at Michigan State University College of Music. Visit ZhouTianMusic.com for more.